to see the entire impressive list. It is fantastic that as time passes, Michael is standing out a bit more and Hunger has yet to have its limited release yet, dated December 5th. But apparently as some critics have seen Hunger at film festivals, they are remembering Michael Fassbender and that is what he needs right now without hype and fanfare - select critics paying attention to this newcomer and noting his work is worthy of consideration. Here is what is said at The Envelope. Michael came in at #9 out of 23 potential contenders. Although the supporting actor Oscar is usually considered the lifetime achievement award, this year's roster of best actor possibilities has several contenders eligible for AARP membership. The average age of the 22 men profiled here is 48, with Clint Eastwood ("Gran Torino") the oldest at 78. Indeed, only Leonardo DiCaprio ("Revolutionary Road") and Michael Fassbender ("Hunger") will still be under the age of 40 come Oscar night. 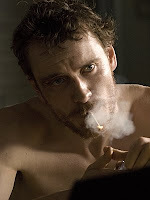 As Bobby Sands, an IRA member who starved himself to death in a British prison in 1981, Fassbender, 31, is at the center of controversial "Hunger," from first-time director Steve McQueen. Four of the last six best actor winners played real-life men, and all but three of the last 20 races have had at least one such nominee.Already a winner of prizes at both the Cannes and Toronto film fests, this small movie could have a big effect in Hollywood with its raw depiction of political protest. And Fassbender radically transforms himself physically, as did nominee Tom Hanks ("Castaway") and winner Robert De Niro ("Raging Bull").